These chilly mornings have left me feeling pretty disinterested in my usual icy green smoothie, but because I know that it is really important to get nutrient-dense foods in my body each morning, I have begun looking to other options. 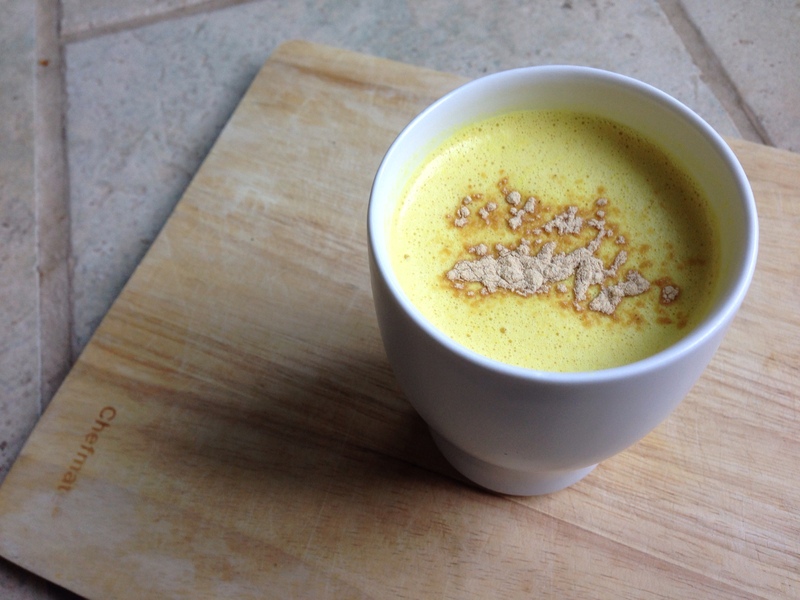 You might have seen my Golden Milk post awhile back (maybe you even tried it!?) so this morning I decided to take it up a notch and include some additional ingredients that take this drink to the next level. This is a total powerhouse cocktail! Warm the nut milk over a low flame for a minute or so but try not to boil. Place all ingredients into a blender and blend until smooth. Enjoy! So, why should you enjoy all of these ingredients, together!? Turmeric is one of those AMAZING herbs that cultures have used for centuries! It combats inflammation in the body and encourages a healthy digestive system. Sesame seeds are loaded with calcium and other essential trace minerals that support overall health. Maca powder comes from the root of a plant that grows high in the Andes mountains and is known as an adaptogen because it helps us adapt to and recover from stressful situations more quickly. It also offers a clean boost of energy and helps to balance our hormones. Raw honey is incredibly medicinal (as long as it is raw) and is used to boost the immune system, combat allergies and heal the body in a variety of ways. Coconut oil is amazing and is a great way to incorporate healthy fats that help the body absorb fat-soluble vitamins. It also supports the health of your brain and neural pathways, and is a great source of energy which can help to burn fat! Cinnamon supports the body in regulating blood sugar and adds wonderful flavor! And lastly, black pepper is included because it helps the body more efficiently absorb the constituents of turmeric. There you have it! Have I gotten you excited about this delicious (and kind of exotic) drink!? I hope so! And if you’re looking to jazz up your morning routine even more, check out my post on Morning-Approved Cocktails! Enjoy! And keep drinking those liquids! Tags: cinnamon, coconut oil, drink, hot drink, maca, morning drinks, raw, raw food, raw honey, smoothie, superfood, superfoods, turmeric, vegan. Bookmark the permalink.